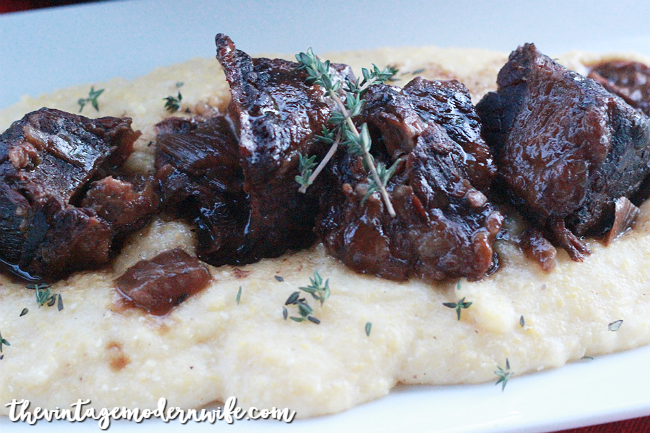 This post on Braised Balsamic Short Ribs and Creamy Polenta was sponsored on behalf of H-E-B. All opinions stated are my own. It’s finally starting to feel somewhat like winter here in Texas and I couldn’t be happier. Winter brings so much nostalgia to me. I recall the first time I came to Waco and met Mathew’s family one special New Years day, I think of our wedding and how we just celebrated 5 years last week, I think of numerous skiing trips to New Mexico with my family, and baking cookies with my cousin Monica and my Aunt Gloria. Winter not only brings nostalgia for fond memories, but excitement for stick-to-your-ribs kinds of foods. Sometimes though, as much as I love them, I get sick of chili or soup. I’m not alone in this, right? I stumbled upon a recipe for Braised Balsamic Short Ribs from H-E-B with creamy polenta and was so excited for a change in our usual recipe rotation. …and to cook it all in? a Cocinaware 5.2 quart Enamel Cast Iron Dutch Oven from H-E-B. This dutch oven is magical. I absolutely love it and it’s the perfect pot for this meal. If you don’t have a dutch oven, it’s time to invest in one- particularly this one from Cocinaware. I got mine in a gorgeous Aqua and it matches my Kitchenaid mixer! The Cocinaware Dutch Oven is great for any recipe that requires braising, soups, stews, casseroles, beans, or your favorite Texas chili recipe. I say that it’s “magical” because it can cook on the stovetop, on a grill, and even in the oven. Plus, it’s so pretty from the enamel coloring, that you can put it straight to the table for a beautiful serving piece. After making the Braised Balsamic Short Ribs from H-E-B, Mathew proclaimed it was the “best meal ever” and licked his plate clean. I’ve never had braised short ribs before, and I will never try another recipe for one because this one is tried and true! The H‑E‑B Pepper Toppers Jalapeno Sweet Balsamic Reduction give these short ribs an unexpected spicy kick, while the wine brings sweetness to it. Although the recipe called for transferring to a slow cooker, I actually just kept my short ribs in my Cocinaware Dutch Oven the entire time (from searing all the way til they were done.) Less mess is best, right? If you keep your Braised Balsamic Short Ribs in the dutch oven, just put it on low/medium-low for 6-8 hours so those deliciously sticky, spicy, and sweet ribs can fall off the bones. I bet you’re dying for the recipe now, right? 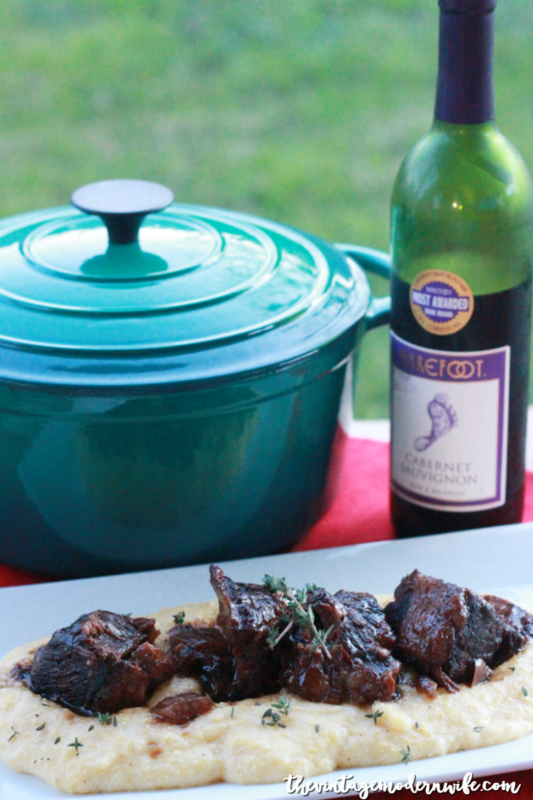 You can get the recipe for the Braised Balsamic Short Ribs right here! If you try it, come back and tell us how much you loved it! 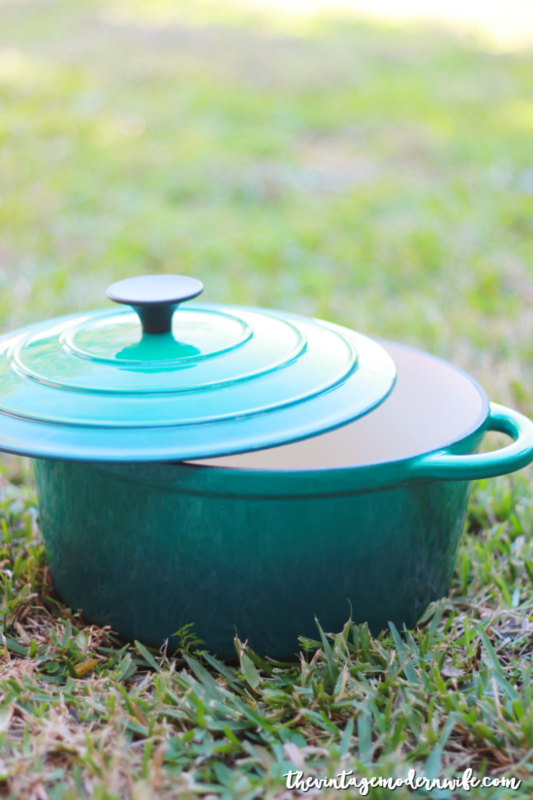 Now go grab yourself a Cocinaware 5.2 quart Enamel Cast Iron Dutch Oven and get to cooking. You won’t regret it! This week I’m super excited for an annual party of mine- Friendsgiving. It’s something I started last year for my Young Living team and I plan on doing it every year. Cooking for people has been a love of mine since I was in high school. My best friend, Sarah, introduced me to the Food Network in the early 2000’s and I’ve been hooked ever since. I love taking unique spins on recipes or changing them up so they’re “fancy” while still being easy. One of my newest dishes that has become a fast favorite? My Low Calorie Butternut Squash and Pancetta Pasta Bake with La Moderna Golden Harvest Penne Rigate! There’s something about cooking that has always fascinated me. As a little girl, I would go to my Memaw and Pepaw’s house after school and I’d help make homemade flour tortillas. I had such joy rolling out the tortillas in different shapes! My Memaw and I would make the dough from scratch and would eat homemade macaroni and cheese while we waited for the dough to rise. I had the best memories at their house just cooking away. I loved watching my Memaw add freshly ground comino (that’s Spanish for cumin!) and garlic to her recipes, and how everything she made was amazingly delicious. During the holidays, I remember cooking with my mom, my aunt, and my Grandma for Thanksgiving. Ruining Thanksgiving cornbread was a talent I once had (ha!) but I redeemed myself by making the green bean casserole. For Christmas, my Aunt Gloria would invite me to her home to make homemade Christmas cookies with my cousin Monica. It was always such a fun time and I looked forward to it each year. There was just something about cooking that always fascinated and inspired me. I’m also really competitive so cooking was a way to compete with myself. How can I get the most reaction out of people that I feed? How can I get this meal to top the last one? 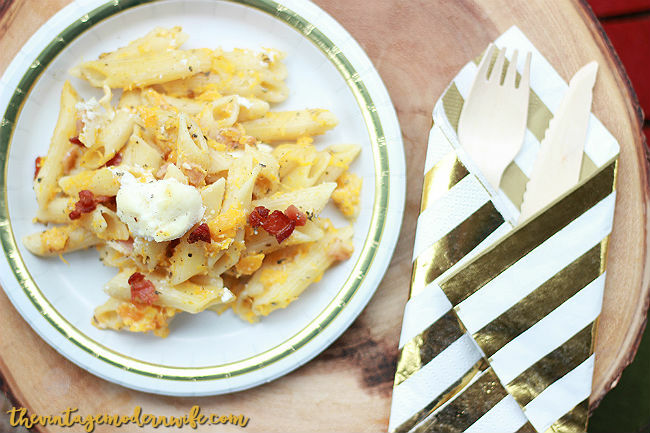 Honestly- this Low Calorie Butternut Squash and Pancetta Pasta Bake made with La Moderna Golden Harvest Penne Rigate takes the cake! Not only that, but since I’m working out with Camp Gladiator right now, I really am watching what I eat and I track my macros. I challenged myself to make this as lightened up as possible without sacrificing any flavor. I think you’ll agree with me that this dish is a perfect one to make during the holidays, for Friendsgiving, Thanksgiving, or even a Christmas Eve meal. Looking for a pasta bake that'll blow your mind? 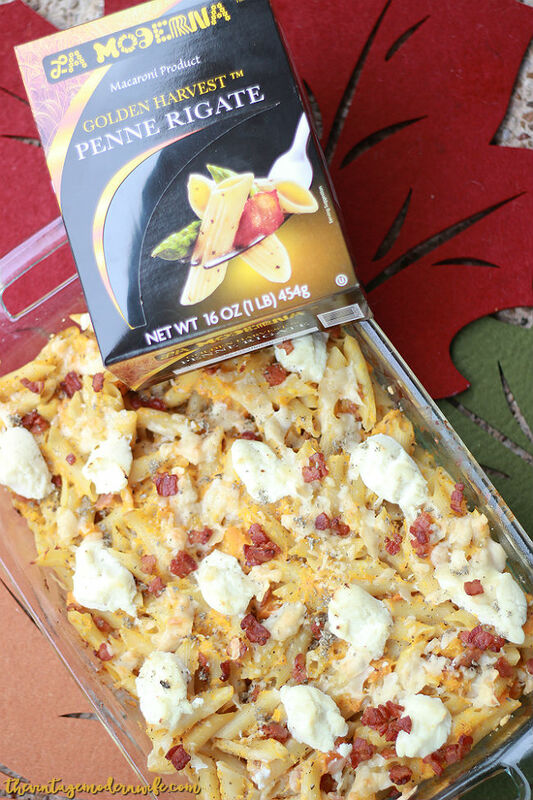 This Low Calorie Butternut Squash and Pancetta Pasta Bake is so delicious and perfect for Friendsgiving, Thanksgiving, Christmas Eve, or just a crazy week! Preheat oven to 375ºF. Thinly coat a baking sheet with coconut oil cooking spray. Thinly coat a 9x11 glass baking dish with coconut oil cooking spray. Place butternut squash onto the baking sheet. Salt squash with 1 tsp salt. Roast about 20 to 30 minutes. Mash the butternut squash on the baking sheet and put to the side. Meanwhile, bring a large pot of salted water to a boil. After the butternut squash has been roasting for about 10 minutes, cook the La Moderna Golden Harvest Penne Rigate for 7 minutes; drain and return to pot. Penne will be very al dente. In a medium saucepan, whisk together milk, flour, garlic, salt and pepper. Bring this mixture to a boil over medium-high heat, whisking constantly. Reduce heat to low and simmer, whisking until thickened, about 2 minutes. Remove the sauce from heat, stir in mashed butternut squash, thyme, and 1 tbsp sage. Add the sauce to the penne and mix with a silicone spatula. In a small pan, cook chopped pancetta until brown and crispy. Drain grease, set aside. Transfer the penne mixture to your oiled baking dish. Dot the top with small spoonfuls of ricotta and then sprinkle with parmesan and pancetta. Sprinkle remaining sage and bake until top is lightly browned in a few spots, about 15 to 20 minutes. This Low Calorie Butternut Squash and Pancetta Pasta Bake is definitely one of our newest meals for the Fall and Wintertime. It’s hearty and makes you feel like you’re being “bad” and eating comfort food, but it’s actually low in calories! The sage and thyme in the Low Calorie Butternut Squash and Pancetta Pasta Bake are really what make this meal taste like the holidays, and honestly, the taste is so delicious, you won’t think it’s low calorie at all. Because I count my macros, I was able to eat a portion and have seconds- and I didn’t feel one bit guilty! I grabbed the La Moderna Golden Harvest Penne Rigate at Walmart. To find La Moderna where you live, check out their product locator. 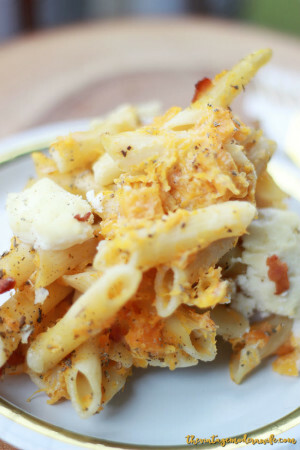 I want this Low Calorie Butternut Squash and Pancetta Pasta Bake to become a staple in our home for the holidays. I want it to be that one meal that people remember years from now as being so delicious that they couldn’t get enough of it, just like I used to do with my Memaw, my Grandma, and my Aunt’s recipes. 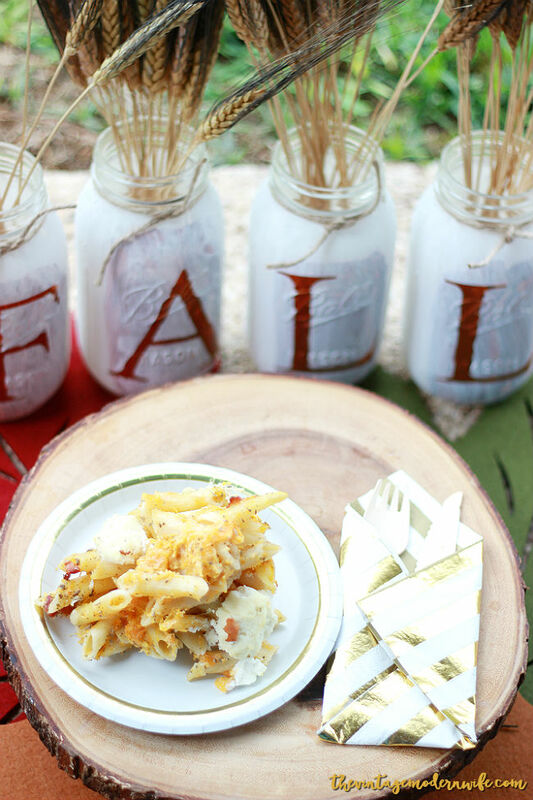 I want them to say, “Remember that pasta bake Stephanie made that one Friendsgiving? Oh man I really want some of that right now!” There’s something so wonderfully satisfying knowing that a recipe has left a mark on someone’s heart! 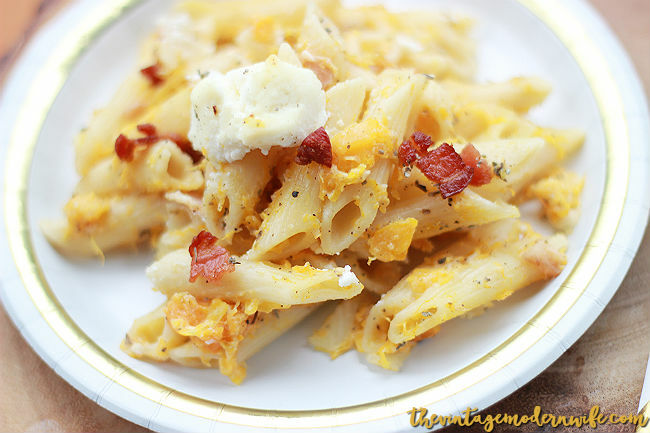 I’d love to know: What occasion will you be making the Low Calorie Butternut Squash and Pancetta Pasta Bake? What’s one holiday recipe that’s left a mark on your heart?